Our politicians are at last speaking about the terror, torture, mass murder and genocide being meted out upon Christians and other minorities by the Islamic State in Iraq. Their assessment of the situation ranges from “completely unacceptable” to “barbaric”. Cardinal Vincent Nichols astutely calls it “a persecution of immense proportions”. The Archbishop of Canterbury calls it “evil”. And not only is it evil, but “part of an evil pattern around the world where Christians and other minorities are being killed and persecuted for their faith”. And he refers specifically to Northern Nigeria, Syria, South Sudan and the Central African Republic. It doesn’t take a genius to work out that his subject is radical Islam and the malignant Saudi-backed Salafist strain. Archbishop Justin knows a thing or two about evil: he has stared it in the face down the barrel of a gun while trying to bring peace and reconciliation to the warlords, bandits and murderous thugs of Africa. When you expect to die and phone your wife to say goodbye, you may begin to grasp what it is to agonise, grieve and suffer because of evil. Archbishop Justin says that this “evil pattern around the world” is brutally violating people’s right to freedom of religion and belief. It is, in fact, killing them for their faith in Jesus Christ. It is persecuting them for heresy, apostasy and infidelity to the temporal objectives and literal truths revealed by Mohammed. The Salafi-Jihadists or Jihadi-Salafists who agitate for a caliphate may constitute less than 0.5 percent of the world’s 1.9 billion Muslims, but that still numbers them around 10 million – sufficient to establish an evil pattern of hard-line Islamisation around the world. It is good that we have an Archbishop of Canterbury who discerns manifestations of evil not only in the principalities and powers of the spiritual realm, but also in the muddled and murky politics of the temporal. His nature is averse to the discordant skirmishes of religio-political polarisation: his heart inclines toward peace and reconciliation. But he knows the unmistakable signs of the times, and can read the moods and movements that transcend the materialistic, corrupt, decadent and immoral obsessions of the age. 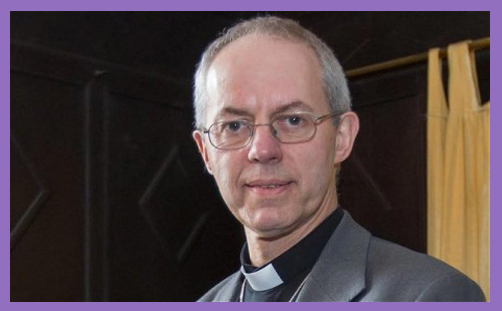 He won’t call it a “clash of civilisations”, but we have in Justin Welby an Archbishop who knows that the greatest threat to the Judæo-Christian ethic is the Islamic revival movement which we call Islamism, Jihadism, extremist or political Islam. Right across the Arab-Muslim world, from the coastal plains of the Maghreb to the Himalayan peaks of Pakistan, a Quranic Curtain is descending. Whatever its fanatical creed and sectarian form, this veil of darkness is asserting the superiority of a culture and civilisation which is inimical to Western notions of politics, religion, morality and enlightenment, to the point that they want to cleanse the earth of all that impedes and obstructs the establishment of the Caliphate – the Islamic State. The evil pattern which is emerging around the world must be routed and disordered. Their future is not ours. This is the repressive and brutal evil which confronts us. Thank God Justin Welby calls it so. Why can bishops organise to condemn foodbanks but not genocide?